Anatomical landmarks are useful but are surrogate markers, difficult to palpate in the obese and those with edema in the back, do not take into account anatomical variations or abnormalities and frequently (70%) lead to incorrect identification of a given lumbar interspace. Recently, there has been an increase in interest in the use of ultrasound (US) to guide during central neuraxial blocks (epidural or combined spinal-epidural, either to preview the anatomy before needle puncture or to visualize the advancing needle in real time). Preprocedural ultrasonography of the spine can supply much anatomical information pertinent to central neuraxial blockade, including the location of the neuraxial midline and interlaminar spaces and the depth of the epidural space and intrathecal space. The recent development of a handheld US (Rivanna Accuro™) as shown in [Figure 1] has inbuilt software which automates midline and epidural depth measurement and improves spinal placement. 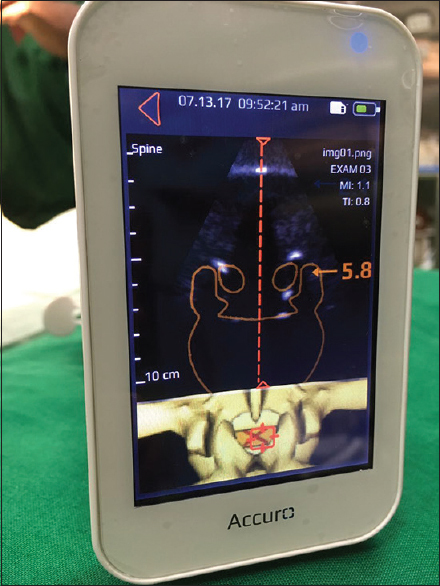 We report a case, for which we used this handheld US to identify midline and epidural space depth. A 65-year-old male known case of osteoarthritis and analgesic-induced nephropathy with body mass index 32.4 presented for the left total knee replacement. The preview US scan was performed in the preoperative room. The US probe was placed in transverse view over desired intervertebral space. 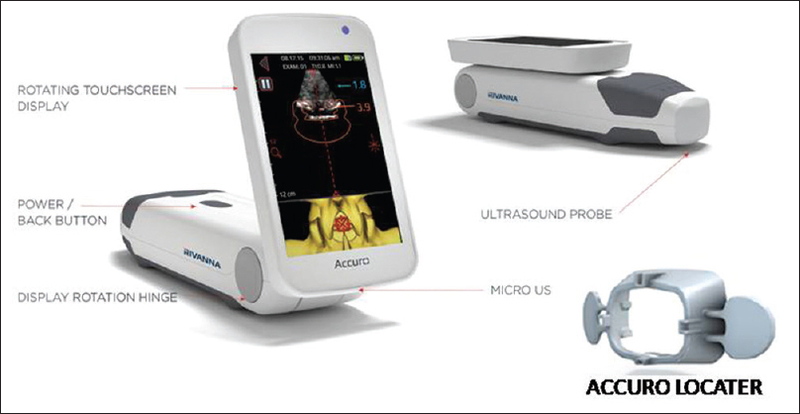 This handheld US (Accuro™ US system) has inbuilt software which automates midline and epidural depth measurement as shown in [Figure 2]. Epidural space depth was 5.8 cm in this patient. This device has Accuro Locator™ which can be fitted over probe as shown in [Figure 1]. After identifying the midline and epidural space depth, we firmly pressed Accuro™ locator over back. It produced 4 marks over back (2 vertical and 2 horizontal) by joining these points we got puncture site. It was marked with permanent marker. The patient was taken to operative room and placed in the sitting position. The Tuohy needle was gradually advanced through puncture site under strict sterile condition up to distance 5 cm directly. Epidural space was confirmed by testing for loss of resistance (LOR) to injection of air using the standard LOR syringe. The needle was marked after achieving LOR with sterile marker. Epidural space was identified at distance of 5.7 cm. Time for epidural space localization was just 28 s. Space was located in the first attempt without any bony touch or other complications. Although handheld US-guided (USG) epidural space localization required less time, less attempts for localization of epidural space, large study is required to establish its utility and to prove the relationship between USG measured depth and actual needle depth. This handheld US device (Accuro™) is a single self-contained unit consisting of a US system, US probe and rotatable touchscreen display. The instrument provides a SPINE imaging preset to facilitate spinal anesthesia imaging guidance with real-time three-dimensional (3D) navigation of the lumbar spine. The SPINE preset uses patent-pending technology, called SpineNav3DTM, to automate spinal bone landmark detection and depth measurements and to assess real-time scan plane orientation in 3D. Accuro™ is about the size of a smartphone and battery operated, and the touchscreen can be rotated for easy viewing. The case described here is the representative case, and further studies are required for proving this device effectiveness, affordability, and reliability in comparison to conventional USG machine. Karmakar MK, Li X, Ho AM, Kwok WH, Chui PT. Real-time ultrasound-guided paramedian epidural access: Evaluation of a novel in-plane technique. Br J Anaesth 2009;102:845-54. Chin KJ, Perlas A, Chan V, Brown-Shreves D, Koshkin A, Vaishnav V, et al. Ultrasound imaging facilitates spinal anesthesia in adults with difficult surface anatomic landmarks. Anesthesiology 2011;115:94-101. Powlovich L, Tiouririne M, Singla P. Does Automated Interpretation of Lumbar Spine Ultrasound Images Increase Success Rate of Spinal Anesthesia Placement for Cesarean Birth among Residents in Training? SOAP 49th Annual Meeting. Bellevue; May, 2017. ACCURO™ Pocket-Sized Ultrasound Device for Spinal Anesthesia Guidance. Rivanna Medical. Available from: https://www.rivannamedical.com/wp-content/uploads/2016/10/Accuro.pdf. [Last accessed on 2017 Jul 10].